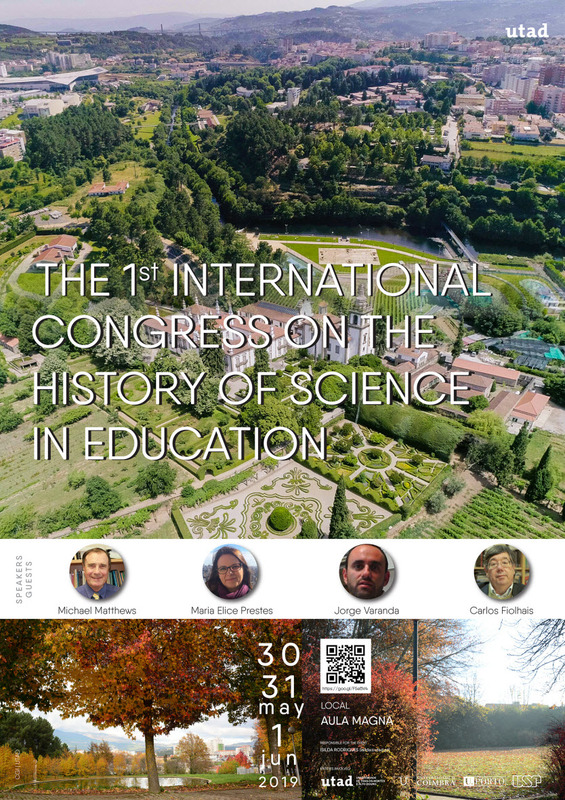 The 1ICHSE rises following the 1st Meeting of History of Science in Teaching and 2nd Meeting of History of Science in Teaching held at UTAD and UC, in 2015 and 2017, respectively, and it will take place every two years alternating between the universities involved. The 1ICHSE aims to bring together researchers, professors and students, interested in the history and teaching of Biology, Geology, Chemistry, Physics and Mathematics, as well as Educational Sciences, Engineering, Medicine, Pharmacy, Biochemistry, Anthropology, Astronomy, Psychology, Economics, Sociology, Ecology, Molecular Biology and Nanosciences, among others, in a multi-centered and multidisciplinary debate. In addition to works focused on teaching, education, didactics and dissemination of sciences, 1ICHSE seeks to bring together reflections and studies of a more general, disciplinary or interdisciplinary nature, in the history of culture, technology and industry, as well as epistemological, historiographic, biographical or prosopographic. Other topics relevant to the history of science and teaching, such as gender studies, the teaching of science in a foreign language and, in general, the various aspects of the interactions between science, technology and the humanities are very important welcome to the dialogue space that 1ICHSE seeks to create. – Discuss strategies for the implementation of the History of Science in Teaching. NOTE: “The participants who want to write only in English must fill all spaces with the english text”. The text should be in the following format: Arial font 12 points; spacing 1,5; use italics instead of underline (except URL addresses); figures and tables inserted in the text and not in its end. It must have a maximum of 15 pages; in Portuguese or English; the margin formatting will be done by the journal editors. The submitted work must have a title (not to exceed 3 lines), authors’ names (without abbreviations), University of origin, city and e-mail address. Abstract and Abstract in Portuguese and English, respectively and up to three keywords. Note: Participants, if they wish, can make payment in the reception of the documentation on the day of the event (Brazilian Participants). · By post – Office of Training of UTAD, 500-801 Vila Real. Only the applications with the duly completed data will be considered and upon delivery of the above mentioned documents.